Nine years in the making, this book has one goal: to rehabilitate the name of the brothers Schlumpf, an endeavor in which the authors are by no means alone. 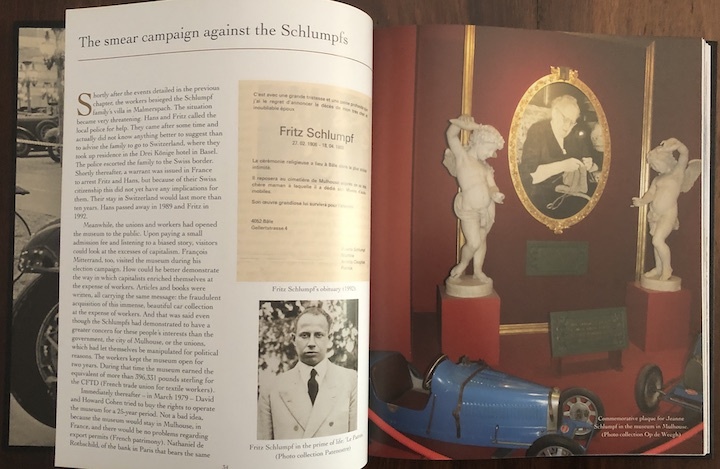 Recall that the Schlumpf car collection was seized and became what is now the National Auto Museum of France. 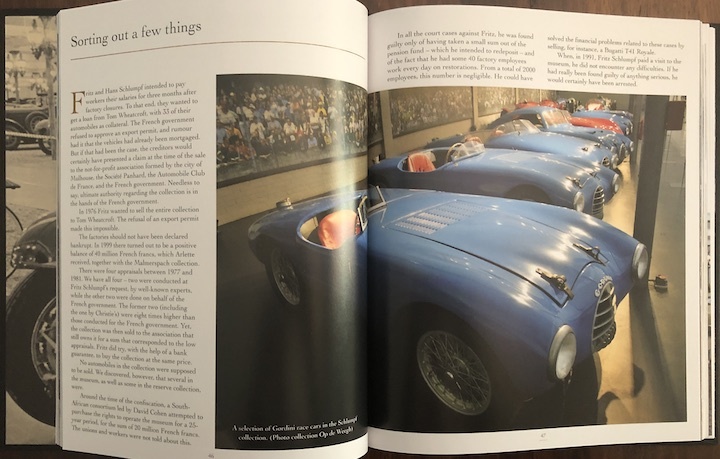 Ever since publishing in 2009/10 their look into the Dorvaz collection and launching an internet project about stolen classic cars the authors felt called to put L’Affaire Schlumpf under the magnifying glass and right from the start billed it as “a revisionist history exonerating the Schlumpf brothers.” Is it a surprise, then, that they found what they were looking for? Before getting into the book in earnest it would be advisable to put oneself into a charitable frame of mind and consider what the authors were up against in relitigating a decades-old case involving unsympathetic principals and having to convince the very people who have the most at stake—the surviving family—to break their silence and trust you. Yes, there is a pervasive sense of hand-wringing and hair-pulling woe-is-us (“we were sure we were followed,” “no one would talk to us,” “there was obstruction”), and an often strident tone, and a most definite lack of impartiality (despite their protestations, albeit at only one place, in the Epilogue, to the contrary). It would be all too easy to label their line of thought mere polemic and move on to the pretty pictures (which, come to think of it, are not all pretty, because a museum/storage environment rarely lends itself to proper lighting, sharp focus, or favorable angles). Since the book revolves around a legal action consider the authors the Counsel for the Defense, which makes you, the reader a member of the jury. Spoiler alert: this reader/juror still has reasonable doubt, less so because of the facts proper than the heavy-handed presentation (every few pages the same talking points are belabored) and absence of incontrovertible evidence. There are, in fact, no altogether new facts introduced into the record here, instead the case is circumstantial and revolves around a reexamination of motive and the alleged prejudice of the prosecuting side. Father (b. 1952) and son (b. 1988) op de Weegh, well-intended as they surely are, do seem to get carried away by their own indignation, which has the unfortunate result of tarnishing their own position with the same thing of which they accuse the other side: bias. They may well be right, or be proven right at some future time, but in this book, by sins of omission and commission, they do not make themselves sympathetic advocates. 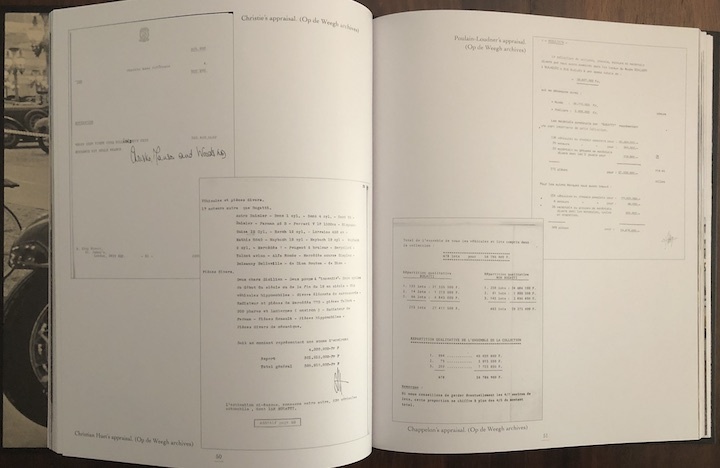 But, the bulk of the book, all but the first 50-odd pages, is actually about other Schlumpf matters so there are some features worth describing. One is a set of lists and the other a close-up look at 15 cars in the collection. Those lists of the museum inventory, too, are not new discoveries but they probably have not been widely seen. They actually make the op de Weeghs’ strongest argument that the French government doctored its case for seizure by manipulating the car valuations, aided by a scandal-happy press itching to shame dirty capitalists. It must be remembered who the players are and when this story transpired. The social and political dynamics at the core of this story are very much of their time and place, making the authors’ argument that the case would have played out differently today hard to refute. 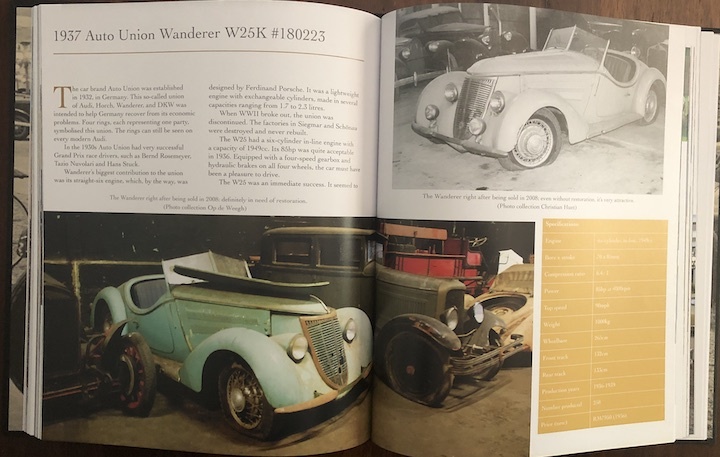 It is the last columns of the lists that are presented as the smoking gun: they represent two sets of valuations of individual cars, one by government appraisers and one by collector car sources. 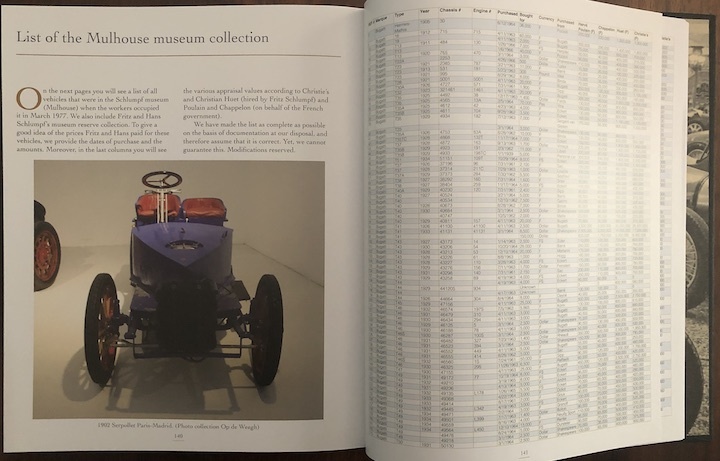 The first list, 8 pages long and containing hundreds of cars, covers the majority of the big collection (Mulhouse) and the shorter list, less than 2 pages, the small Malmerspach collection. The Mulhouse appraisals of the two sides are vastly different, by as much as a factor of 8 (cf. one side values a car at 30,000F and the other at . . . 1,900.000!). How to account for this discrepancy? But with the Malmerspach cars this is not true; in half the cases the government appraisal is higher! The authors neither explain this nor even draw attention to it. And so we return to the opening thought: is there bias on the authors’ side, and does it hurt their case? There is no merit in flogging this more; readers will have to decide for themselves. Reams of period press material and other published accounts are easily found today. 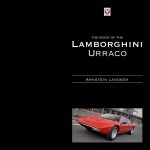 As the authors’ other three books, this one was first published in their native Dutch. The English version reads quite well. 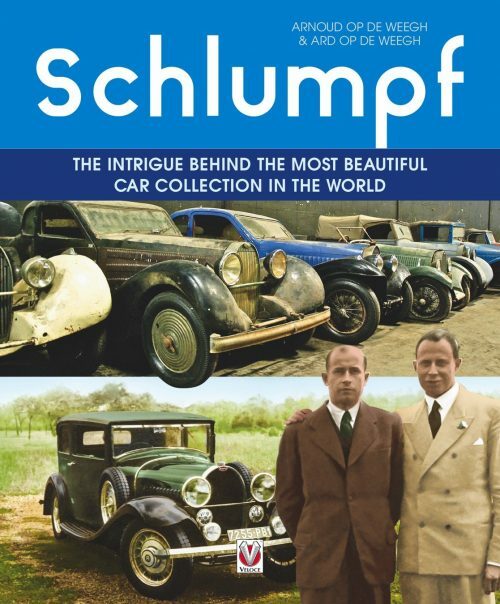 That they insist on calling the Schlumpf Collection the “world’s most beautiful” seems quite unimaginative; the Schlumpfs were not historically sensitive connoisseurs (unlike, say, a Peter Mullin who bought a number of their cars); Fritz S’s avowed purpose in life was to amass more Bugattis than the next guy; the museum’s holdings were not representative of a theme or movement. Of course, some important cars fell into their hands. 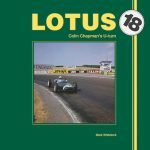 The reason for singling out the 15 cars for in in-depth look or why they are arranged the way they are is not given. Doesn’t really matter. For each car (commendably all identified by chassis number) some basic history and specs are given and, as applicable, their post-sale history is traced. The Index is a bit light but at least there is one. The book is absolutely worth reading—just don’t turn the ‘ole brainbox off. And, certainly, the op de Weeghs have done their subject and themselves no disservice. That they tread on thin ice is in the nature of the beast and not a shortcoming, and if anything they deserve credit for rolling up their sleeves. Copyright 2019, Charly Baumannn/Sabu Advani (speedreaders.info).